Timo Boll has accomplished many notable achievements in his table tennis career, with multiple successes at several high profile events. Now 35-year-old Timo Boll has added another title to his name, after he picked up his 11th national Men's Singles trophy at the 2017 German Championships. The first German Championships title win for Timo Boll came at the 1998 edition of the tournament, and he had since gone on to add another nine Men’s Singles gold medals to his name at the competition prior to Sunday 5th March 2017. However, Boll had never won the top prize in Bamberg prior to the 2017 competition and so his success at the 85th German National Championships will mean that extra little bit more. Playing in front of about 2400 spectators at the BROSE ARENA on the final day in Bamberg, Timo Boll put in a delightful performance in the Men’s Singles final as he cruised through the tie against Ruwen Filus without dropping a game (11-4, 11-8, 11-2, 11-5). “I was a bit sceptical before the tournament, not quite fit… Now I am well with Bamberg”, Timo Boll. 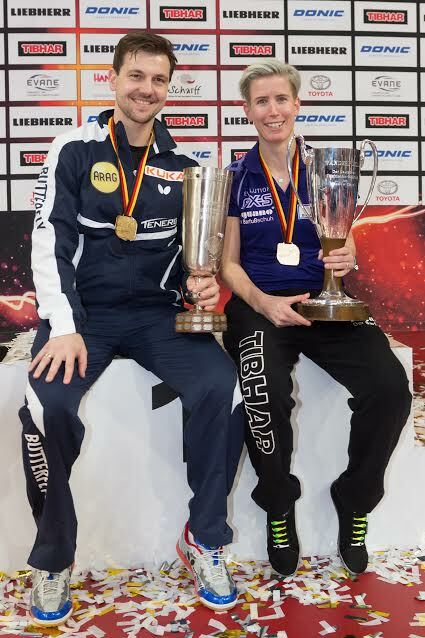 Kristin Silbereisen has become the Women’s Singles champion of Germany for the third time in her career, after she followed up her successes achieved at the 2010 and 2016 events with the capture of the 2017 title. Opposing Kristin Silbereisen in the Bamberg final was Shan Xiaona, who was also fighting for her third trophy in the category having won the 2013 and 2014 tournaments, which were hosted in Bamberg and Wetzlar respectively. The opening of the final actually saw Shan Xiaona make the brighter start of the two players as the top seed for the event moved into a 0-2 lead, but Kristin Silbereisen kept her cool and made the perfect response as she claimed four games in a row to steal the title right under the feet of her opponent (11-13, 9-11, 11-9, 11-5, 11-8, 13-11). “After the first two games I did not know how to win a game. From the third game on, I thought I’d play on a game-by-game basis, and I got into the match”, Kristin Silbereisen. Kristin Silbereisen and Shan Xiaona may have been rivals in the Women’s Singles final, but they also proved to be the perfect partnership as they combined well in the Women’s Doubles draw. The pairing of Kristin Silbereisen and Shan Xiaona comfortably powered to a 3-0 victory over Tanja Krämer and Jessica Göbel (11-6, 11-3, 11-7) to win their second title as a team. There was also the Men’s Doubles final on the agenda for the concluding day of the 2017 German Championships, and for the second consecutive year it was Ruwen Filus and Ricardo Walther who received the prize as they overcame Kilian Ort and Qiu Dang (11-4, 7-11, 11-7, 11-8).